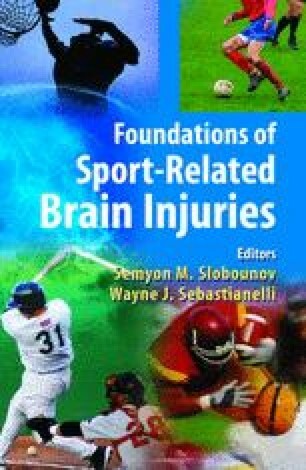 This chapter is a review and analysis of quantitative EEG (qEEG) for the evaluation of the locations and extent of injury to the brain following rapid acceleration/deceleration trauma, especially in mild traumatic brain injury (TBI). The earliest use of qEEG was by Hans Berger in 1932 and since this time over 1,600 peer reviewed journal articles have been published in which qEEG was used to evaluate traumatic brain injury. Quantitative EEG is a direct measure of the electrical energies of the brain and network dynamics which are disturbed following a traumatic brain injury. The most consistent findings are: 1- reduced power in the higher frequency bands (8 to 40 Hz) which is linearly related to the magnitude of injury to cortical gray matter, 2- increased slow waves in the delta frequency band (1 to 4 Hz) in the more severe cases of TBI which is linearly related to the magnitude of cerebral white matter injury and, 3- changes in EEG coherence and EEG phase delays which are linearly related to the magnitude of injury to both the gray matter and the white matter, especially in frontal and temporal lobes. A review of qEEG reliability and clinical validation studies showed high predictive and content validity as determined by correlations between qEEG and clinical measures such as neuropsychological test performance, Glasgow Coma Scores, length of coma and MRI biophysical measures. Inexpensive and high speed qEEG NeuroImaging methods were also discussed in which the locations of maximal deviations from normal in 3-dimensions were revealed. Evaluation of the sensitivity and specificity of qEEG with a reduced number of EEG channels offers the feasibility of real-time monitoring of the EEG using Blue Tooth technology inside of a football helmet so that immediate evaluation of the severity and extent of brain injury in athletes can be accomplished. Finally, qEEG biofeedback treatment for the amelioration of complaints and symptoms following TBI is discussed.